If I could recommend anywhere to shop in the UK it would be Bicester Village, it's an outlet village so everything is discounted. I noticed that they had a Kate Spade store, I had seen a few people talk about Kate Spade on youtube, blogs and on tumblr but had never properly looked into what they sell. I went into the store and fell in love with about a million bags, purses, jewellery and accessories. I noticed this bright fuschia bag and instantly fell in love with it, I recently got my Mulberry Bayswater which is a practical bag and goes with any outfit so this bag is perfect when I want a pop of colour. There is so much space inside this bag, there is the main compartment then two smaller compartments on each side of the bag so I can carry everything in it. My mum even said she preferred this to my Mulberry! Now onto the price, I looked at the tag and saw £330, my heart sank as I am trying not to spend too much money at the moment (although I have failed at this quite a lot last month) but then below it said "50% off now £165" I did a little jump, then I noticed "extra 20% off." So in the end I got this bag for £132! I knew I had to have it and I hopped on over to the till and purchased! I am so happy I got this bag, I absolutely love it! I had seen quite a few photos on Tumblr of the Kate Spade phone cases and whenever I go into phone stores I see them hanging up looking all pretty so I am so happy to now own one for my iPhone 4S! It was great timing as my old Topshop case was getting a bit battered and old! I am absolutely loving this case, it's so pretty and feels like it is going to last a lot longer than all my other cases as it is very sturdy. There is a rubber bumper to put on before the actual case which makes it feel a lot more secure as it is tight and in place. I would totally recommend you purchase something (or everything in my case as I now have a wishlist as long as my arm) from Kate Spade, I am already planning my next visit to the store in Bicester Village. Their bags are right up my street as they have some really bright and bold colours, however they also have some lovely bags and accessories in plain colours like cream and black so there really is something for everyone! Do you own anything from Kate Spade? These are both absolutely beautiful! 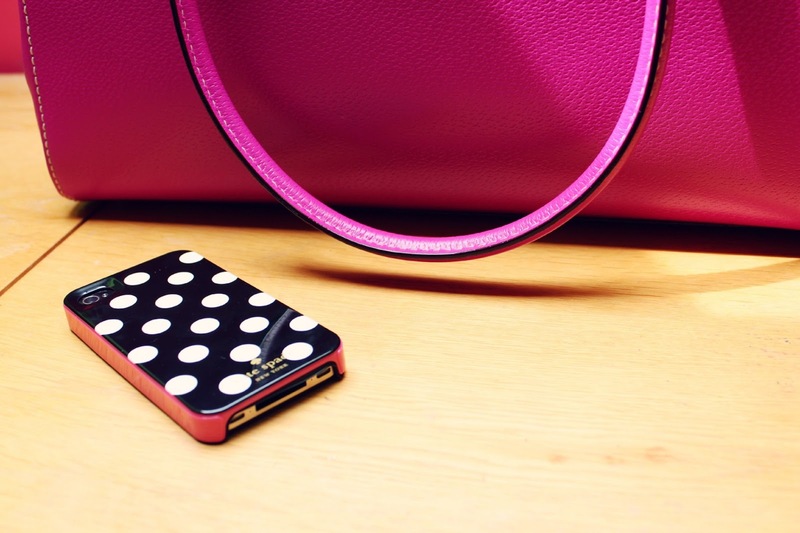 The Kate Spade cases are brilliant! Oooh, I love the phone case and will be looking for one!! I love Bicester Village it's such a shopping lovers dream! I adore your style Georgina, both items are stunning! I don't own anything from Kate Spade, but wish I did! This bag is gorgeous and well done you for getting such a bargain! 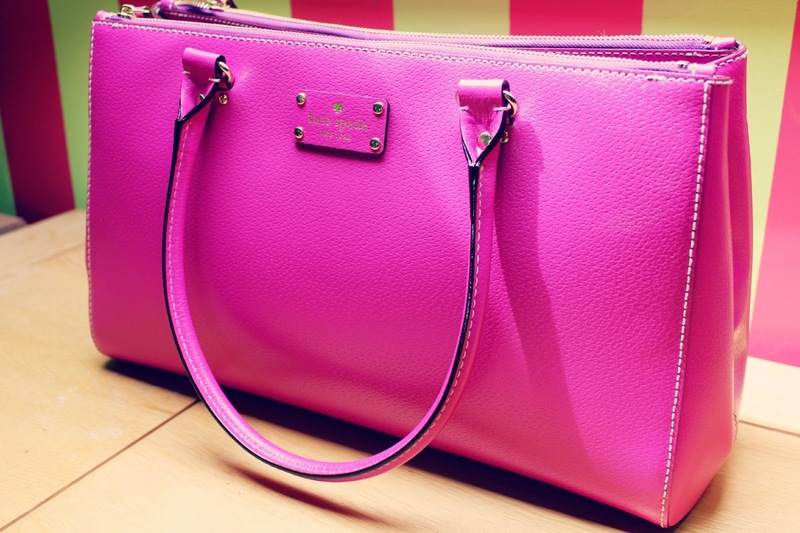 Oh my, your bag is absolutely gorgeous! It's definitely a statement piece for summer. There's also nothing better than going to a till to find out your item's on sale! Ooh I have the exact same phone case! Now to get the exact same bag! What a bargain! !